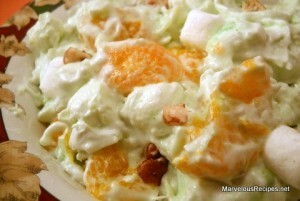 This “taste sensation” salad will have your family coming back for seconds! 1. In a large bowl, combine undrained pineapple, mandarin oranges, mini-marshmallows, pecans and coconut until well blended. 2. Sprinkle dry pistachio pudding mix over the fruit mixture and stir to blend well. Fold in the Cool Whip. 3. Pour into a 2 quart serving dish. Cover and chill in the refrigerator until ready to serve. Serves 6.